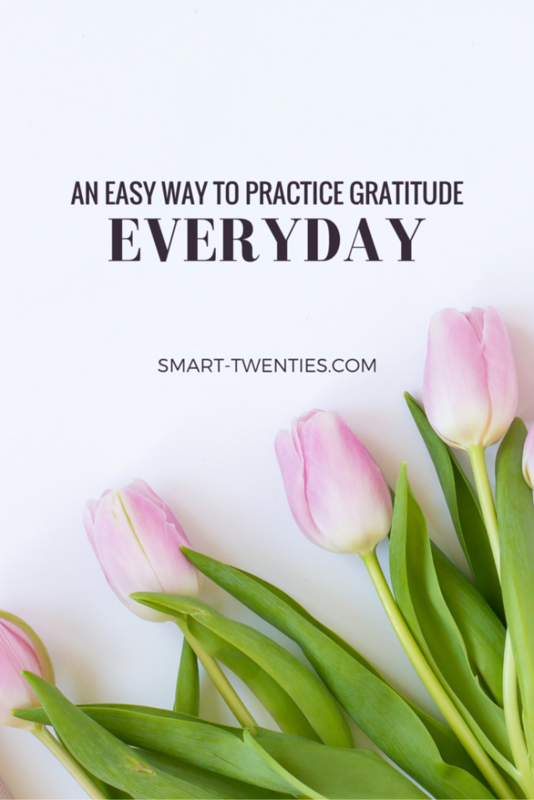 Creating a daily gratitude practice is like that new, promising workout plan. We all know we should do it and we all want to do it, but a lot of us still struggle to make it actually happen. We’re constantly told that we should be upgrading, planning, dreaming, always setting our sights on something better. And, because being grateful is often confused with ‘settling’, we seem to think we have to make a choice between gratitude and knowing we deserve more than what we currently have. Just to get things straight, being grateful and settling aren’t the same thing. Being grateful is about appreciating what you already have. You can be grateful and still dream for more, they’re not mutually exclusive. Settling, on the other hand, is about resigning to what you already have. When you settle you stop dreaming. So this post is about being grateful, not settling or being ‘realistic’ or stopping dreaming. It’s about appreciating what you have and it doesn’t come at the cost of your deepest hopes and desires. It’s about training your mind to work for you, instead of against you. I’ve been experimenting with gratitude over the last year or so and, true to the stats, I’ve found that I’m noticeably happier when I’m paying attention to the little things I love about my life. I originally started by writing in a gratitude journal everyday (something I’ve just returned to doing) but if you’re not keen on that I know a much easier, more approachable way to start training your mind to see the good. What are your 3 good things? But we definitely haven’t always done this. We used to ask each other the usual ‘how was your day’ and things would just flow from there. If it was a good day, the response would be pretty good. But if it was a bad day, this question can pretty easily become a gateway to a 1 hour focus session on every single little annoying thing that happened that day. The problem is that the ‘how was your day’ question doesn’t really give any direction to the answer. We still ask each other this question though. I think gratitude and positivity are great things but at the same time, we shouldn’t completely ignore everything else. In my experience, burying frustration or anger or anything else under fake positivity isn’t really that productive – it always bubbles to the surface eventually. We’ve probably been doing this for about 6 months now and every single day we have both been able to find 3 good things. There have been good days and there have definitely been bad days, but everyday even if they are the teeniest tiniest littlest things, we always find something good. The thing I love about doing this with someone else is that there’s accountability built into it – you have someone reminding you to turn your mind to the good stuff. And after doing this for awhile, your list of good things starts getting easier to come up with. And then longer. Plus it’s fairly easy to start doing this habit with someone too – all you have to do is ask them the question. The first time I asked my boyfriend the whole ‘what were 3 good things’ he kind of paused for a second, because we hadn’t talked about our day that way before, and then he answered it. I think a lot of people will be happy to share the highlights of their day and have something different to answer instead of the generic ‘how was your day’. It will probably take a few weeks to really get the ball rolling, but it’s definitely worth persisting. It’s easy to do but it’s also easy not to do, so just make the decision to do this little thing for your happiness and that of those around you. And always try to find 3 things, even if it’s a struggle. You’re training your brain and it’s just like training your body – if you don’t get uncomfortable you’re not making any improvement. Find 3 things. You can do this with anyone and the best thing is that you can do it anyway you like – in person, on the phone, via Skype, in a text message, through Snapchat, Instagram, Facebook… need I go on? If you think hard enough there will definitely be someone you can start this with. But I will say, there are some people who might not take to this question so well. We all know people who LOVE talking about how bad their day was – all the frustration and the stupid, annoying, wrong people they encountered that day, not to mention how tired they are and how they’re not getting paid enough. These people are draining. You can probably still do this little ‘3 good things’ thing with someone like this, but the approach will have to be a little bit different and a little more strategic. Start slow – at the beginning only ask them abut 3 good things on a good day (or even just 1 or 2) and build up from there over the coming weeks. You might be surprised by how a different question changes the way they see their day. Starting this habit is a great way to train your (and their) mind to see the good stuff, and how could that not make you happier? If the people you hang out with aren’t into this sort of stuff, don’t worry. Just say you heard someone talking about it on the radio or something and you thought it would be interesting to ask. This tiny little thing has had a HUGE impact on how I see the myself, others and the world and I highly recommend doing it. As I said before, it’s easy to do but also easy not to do so make it part of your routine. When Steve and I started doing it we always talked about it when we were brushing our teeth. There are so many possibilities, just think of your routine and what might work for you. Update: I published this blog post nearly three years ago (!!!) and Steve and I still do this every single night! Since it’s had such a huge impact on my life, I filmed a Youtube video to tell you more about it and what I’ve learned! Make sure you watch this video if you’re serious about reaching your full potential. And don’t forget to subscribe to my channel if you find it helpful, I post new videos everyday! Don’t forget that comments are always welcome and appreciated – I’d LOVE to hear what you have to say! That’s exactly why I started doing this! It’s so much easier to put into your everyday life since most of us already ask ‘how was your day’ to whoever we live with so it’s easy to add in ‘and what were 3 good things about today’. This is a great idea! I always ask people how their day was. You would like the 2 year discovery journal. I’m going to do a blog post about it soon. Do you keep a journal? If not, you should start a happy or gratitude journal because you always share positive things on you blog. Keep up the great work! I have been keeping a gratitude journal too (especially since my boyfriend is away at the moment) and I write down 3 things I’m grateful for when I wake up and 3 things just before I go to sleep. I LOVE it! Thanks so much for your comment! I agree – it is the mundane little things that we don’t take notice of that really are actually special, we just don’t appreciate them because they’re always there. Yes it’s exactly like a workout buddy – if you both feel like the other person likes doing it then you make more of an effort to keep going. Thanks for your comment! i definitely believe in this as well, writing in a journal everyday is a great idea! Thanks for your comment 🙂 Writing in a journal everyday is great too! Thanks so much for your comment 🙂 I’ll check out your blog! I love that photo (and this post)! Is it a photo of you? It looks like the Chicago skyline is behind you. I wish this photo of me! It’s not but I do believe it is the Chicago skyline. You can find where the photo is from at the very bottom of the post. Great post! Awesome idea. I plan to start this immediately. Thanks so much for your comment! I’d LOVE to hear how it goes! I love this! I am going to have to try this with my boyfriend tonight!